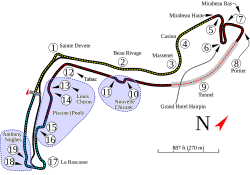 The circuit is used on two weekends in the month of May of each year to host the Formula One Monaco Grand Prix and Formula E Monaco ePrix (odd years) or Historic Grand Prix of Monaco (even years). Formula One's respective feeder series over the years – Formula Two, Formula 3000 and today the GP2 Series – also visit the circuit concurrently with Formula One. Due to the tight and twisty nature of the circuit, it favours the skill of the drivers over the power of the cars. However, there is very little overtaking as the course is so narrow and dangerous. Nelson Piquet likened racing round the course to "riding a bicycle around your living room". Prior to 1987, the number of cars starting the race was limited to 20, compared to 26 at other circuits. The famous tunnel section (running under the Fairmont Hotel, marked in grey in the circuit diagram above) is said to be difficult for drivers to cope with due to the quick switch from light to dark, then back to light again, at one of the fastest points of the course. In January 2009, the circuit was voted top of the "Seven Sporting Wonders of the World". Circuit de Monaco Facts for Kids. Kiddle Encyclopedia.